Plants are complex organisms, and as resilient as they are in nature, they’re also delicate enough that suboptimal growing conditions can seriously impact their health. The temperature and relative humidity in a greenhouse are two factors that have an enormous impact on plant growth, and a greenhouse with improperly managed atmospheric conditions will never operate at its full potential. Luckily, there are a number of management techniques that can be applied to keep both the temperature and humidity in a greenhouse at optimal or near-optimal levels, encouraging healthy growth, strong crop yields, and minimized costs. Relative humidity describes the amount of water vapor held in the air compared to the amount that would be required for saturation – when the water would then condense into liquid form. It has a big impact on plants, as relative humidity affects a plant’s ability to perform its core biological functions. Specifically, relative humidity has a major effect on transpiration – the process in which a plant takes in water through the roots, transports the water through its tissue, and eventually passes it back into the atmosphere through evaporation from its leaves. Transpiration helps move water used for photosynthesis and growth, and also plays a significant role in cooling the plant, making it a key factor for overall plant health. Much like how a high relative humidity causes our own sweat to stop evaporating, reducing our ability to cool ourselves, overly high humidity slows the transpiration process and poses a potential threat to some types of plants. Likewise, rapid swings in humidity levels can also cause significant damage to plants. A 20% swing in relative humidity lasting only a few minutes can potentially result in tissue damage, as plants – which are used to the relatively slow humidity changes that happen in nature – simply can’t adapt fast enough. Greenhouse temperature factors directly into relative humidity levels because the temperature of the air impacts its ability to hold moisture. Warmer air has a larger capacity to hold water vapor, lending itself to higher relative humidity and making temperature a major factor in humidity control. There are a number of factors that can significantly impact a greenhouse’s temperature and humidity, including the wide external temperature swings from day to night, or the circulation of outside air into the greenhouse environment. Considering the importance of temperature and relative humidity on plant health, it’s obvious that the conditions in a greenhouse can’t be left unchecked, and must be carefully controlled. There are different ways that greenhouses can be controlled depending on their location and the surrounding atmospheric conditions. In humid environments, passive and active ventilation are popular methods of controlling temperature and humidity, as the air is already moist and simply allowing convection to move hot air up and out and cooler air in will effectively regulate temperature. In drier environments with already-low relative humidity, simple ventilation often isn’t enough to effectively keep temperatures down and humidity at optimal levels for plant growth. In these dry environments, evaporative cooling is a much better option. Evaporative cooling works by adding water into the greenhouse environment which is then allowed to evaporate in the hot dry conditions, carrying heat away while simultaneously adding moisture into the air. Evaporative cooling can be achieved in different ways, with fan and pad systems being one of the most popular in commercial use. In a fan and pad system, a large, wetted surface is installed on one wall of the greenhouse, and a series of exhaust fans are installed on the opposing wall. The pad side is fed through a water supply to continuously release water vapor into the greenhouse environment. Air is pulled in through the pad, and the cooled, humid air is then drawn through the greenhouse by the exhaust fans and expelled to the outside atmosphere. Upsides to fan and pad systems include easy operation and relatively low operating costs. The pump system that feeds the pad is relatively simple, and the fans can be set to draw specific air volumes based on the needs of the plants. Downsides include the potential buildup of mineral deposits, bacteria, and even algae on the pads, and an uneven temperature gradient between the pad-side wall and the fan-side wall. One alternative to fan and pad cooling is high-pressure fog systems. These systems use a series of nozzles distributed evenly throughout the greenhouse to inject tiny water droplets – essentially artificial generated fog – into the greenhouse. As with fan and pad systems, that moisture introduced into the greenhouse is then evaporated by the hot, dry air, cooling it and regulating humidity levels. 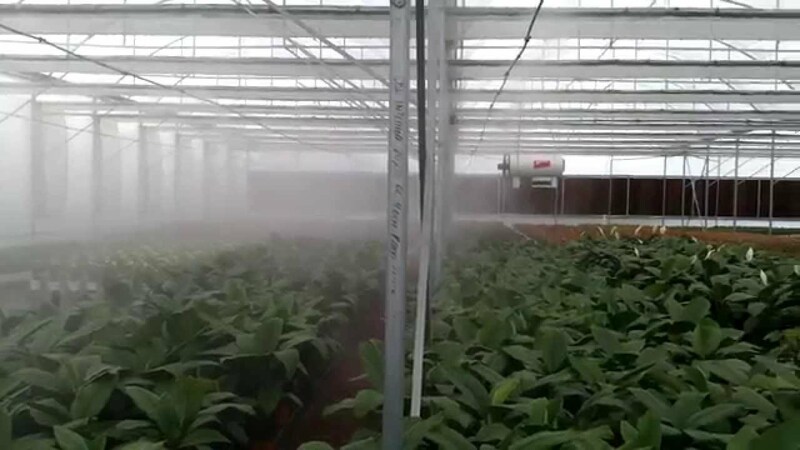 The main benefit to a high-pressure fog system is even coverage and consistent atmospheric conditions within the greenhouse. The downside is that the water droplets introduced into the air need to be carefully tuned for size. If they’re too small and evaporate too quickly, they won’t effectively cool and humidify the air. If they’re too big and evaporate too slowly, they’ll settle onto the plants, which can then cause mold, mildew, and plant damage. Shade curtains installed within greenhouses are often thought of primarily as a way to meter the amount of light that plants are exposed to, but they also make effective thermal shields that can keep heat out or keep it in depending on what the plants need. In cases of extreme heat, retractable curtains can be used to help reduce the temperature inside a greenhouse, keeping the plants safe from acute heat stress symptoms. Conversely, shade curtains deployed at night can help to keep temperatures inside a greenhouse up when the outside air temperature drops. Curtains are a simple, effective method to help control greenhouse conditions and reduce the costs associated with more active cooling methods, but if misused, they can actually hinder photosynthesis, transpiration, and overall plant health. As a result, curtain systems are generally programmed to automatically retract or extend based on time of day and conditions within the greenhouse. Greenhouses are simple structures, but complex environments, and while some locations make it easy to keep them at optimal temperatures and humidity levels, in most cases, they need a little help. Depending on the type of climate a greenhouse is built in, there are a number of different management strategies that can be employed to keep plants happy and healthy. In highly ideal climates, that might mean something as simple as passive ventilation. In drier, hotter areas, active measures like evaporative cooling might be necessary. Whatever system is chosen, the key is understanding the temperature and humidity levels that each type of crop thrives in, and working to ensure that those plants are given the right atmospheric conditions for healthy growth.